Beautiful photo. I love the muted colours. Aren't you afraid they'll freeze and break up into a million tiny pieces??? I love the laundry photos! Are those chamois shirts? My favorites. 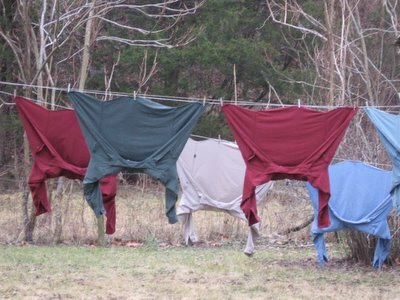 When I opened this up, suburb-raised Kyra starting laughing and asked why all those clothes were hanging upside down....the poor child has no idea what a clothesline is, LOL. But that should change soon, if I get the house I'm looking at!! I just hope those are upside-down shirts and not right-side-up pants. I love this picture. I miss my clothesline, but can't have one where I live.